This is another beer I purchased at Top Shelf Brews in Hampton New Hampshire. This is the second imperial red/amber that I had in a short amount of time. The first was Red Sky at Night from Blue Lobster which was excellent and this was a great follow up. Not quite up to the same standard as Blue Lobster but still a very flavorful beer. As you can see from the picture this beer has a great red color with a huge off white head. Aroma is mostly caramel malts but there certainly are some fruity hops in there as well. Taste has more hops than I expected from the smell but it is also fairly sweet with a fair amount of bitterness. Overall this is a pretty tasty beer. Quite impressed with my first beer from Oskar Blues and looking forward to more from them soon. Brewers Description: Our “Velvet M-80” is a hefty, dry hopped double-red ale with a nose full of aroma, a sticky mouthfeel, a malty middle and unctuous hop flavors. G’Knight sports a surprisingly sensuous finish for a beer of its size (8.7% ABV, 60 IBUs). It’s brewed in tribute to a fellow Colorado craft beer pioneer and Vietnam vet who died fighting a 2002 wild fire outside of our Lyons hometown. For all the details behind this tribute follow this link to www.N3978Y.com. G’Mornin’. G’Day. 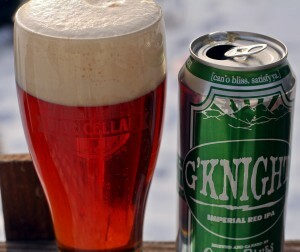 G’Knight.